Which Foods and Supplements Promote Calmness and Soothe Your Emotions? Oranges for stress relief, who knew? It turns out that vitamin c relieves stress by returning your blood pressure and levels of cortisol (a chemical produced by the body when you’re under stress) to normal quickly. People who take 1,000 milligrams of c before giving a speech have lower levels of cortisol and lower blood pressures than those who don’t. So lean back, take a deep breath, and concentrate on peeling a large orange. The 5-minute mindfulness break will ease your mind, and you’ll get a bunch of c as well. Vitamin c is important is lowering the level of cortisol that is produced by stress. Vitamin c is also important in lowering blood pressure. Calm down and concentrate on peeling a large orange. Not only will you be getting much needed vitamin c, the peeling will also help soothe you. Some people also find the scent of oranges and other citrus fruits relaxing. Bananas. Bananas are chock full of nutrients, including potassium and magnesium. Adding bananas to the diet helps the brain release both serotonin and melatonin, as well as promoting muscle relaxation and relief from stress, according to clipmarks.com. Berries. For those tough times when tension tightens your jaw, try rolling a frozen berry around in your mouth. And then another, and another. Since the carbs in berries turn to sugar very slowly, you won’t have a blood-sugar crash. The bonus: they’re a good source of vitamin c, which helps fight a jump in cortisol, a stress hormone. Any kind of berries will do the trick. Strawberries, blueberries, raspberries…any berries! Because the carbohydrates found naturally in berries turn to sugar very slowly, you won’t have a blood sugar crash. 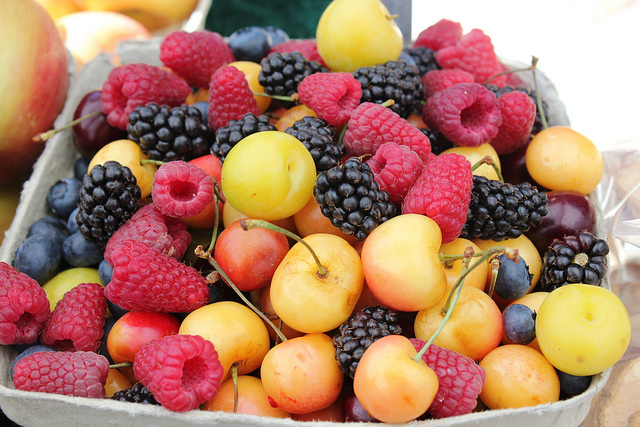 Berries are also a good source of vitamin c, which helps fight the stress hormone cortisol. Add berries to your cereal or just eat them one at a time–instead of the candy! Mixed nuts. Just an ounce will do. Walnuts help replace those stress-depleted b vitamins, brazil nuts give you a whopping amount of zinc (which is also drained by high anxiety), and almonds boost your e, which helps fight cellular damage linked to chronic stress. Buy nuts in the shell and think of it as multitasking: with every squeeze of the nutcracker, you’re releasing a little tension. Nuts are a fast way to fix depleted vitamin b. An ounce of nuts will not only replace vitamin b, but it also will give you a healthy amount of zinc. Vitamin e is found in almonds and will help to fight cellular damage that comes from chronic stress. Stress is a great excuse to indulge in creamy guacamole. Not only will you get instant stress relief from this green marvel, you’ll also do your heart good. Avocado contains both monounsaturated fat, and potassium, which can lower your blood pressure. If you’re craving something creamy, look no further. Avocados are loaded with b vitamins, which stress quickly depletes and which your body needs in order to maintain nerves and brain cells. Plus, their creaminess comes from healthy fat. Vitamin b is essential for nerves and brain cells. Unfortunately, stress quickly rids your body of essential vitamin b. Fortunately, avacados are filled with b vitamins. Asparagus. Each tender stalk is a source of folic acid, a natural mood lightener. Dip the spears in fat-free yogurt or sour cream for a hit of calcium with each bite. Salad with grilled chicken or fish. Leafy greens–arugula, chard, spinach–are rich sources of b vitamins, which are part of the assembly line that manufactures feel-good hormones such as serotonin, dopamine, and norepinephrine. Just like your mother told you, porridge is good for you. Oats contain carbohydrates which are absorbed slowly, and this enhances the serotonin-producing abilities of your brain. Serotonin is your body’s own stress-relieving chemical. So if you know you’ll have a busy, high-pressure day, take a few moments to eat a bowl of porridge or muesli before you leave the house. Oatmeal and a banana. Melatonin is found in only a few foods, and these are two of them. Eating a piece of whole grain toast stimulates insulin production in the pancreas, which then helps neural pathways get tryptophan to the brain more rapidly. This stimulates serotonin and helps induce sleepiness. According to clipmarks.com, oats are high in melatonin, and eating foods made with oats or oat bran can help you relax and fall asleep more readily. Salmon is packed with omega-3 fatty acids, and they keep cortisol and adrenaline (another chemical your body produces when you’re under stress) in check. If you hate fish, you can buy capsules of omega-3, but fresh salmon is better for you. Eating fish rich in omega-3 fatty acids–salmon, mackerel, trout–can lower the likelihood of feelings of hostility by almost 20 percent. Seafood is a stress buster because of the omega-3 fatty acids it contains. Fatty fish such as salmon, tuna, mackerel, and sardines are some of the best sources of omega-3s. One study showed that substance abusers who took an omega-3 fatty acid supplement experienced less anxiety than those who didn’t. Omega-3s are also good for the heart and help to lower blood pressure – another bonus when it comes to health. Dark chocolate. Make sure it is atleast 70% cocoa because it is highest in antioxidants. Antioxidants have been found to fight cancer and heart disease. Get the berries and make fondue-that is sure to eliminate some stress in your life! A study showed that eating a small dark chocolate candy bar each day can lower levels of stress hormones such as cortisol, norephinephrine, and epinephrine which cause a person to feel nervous and anxious. It also alters the levels of neurotransmitters in the brain that play a role in controlling mood. Raw honey. Organic honey can help people calm down and fall asleep more easily. Raw honey is predigested in bees before it reaches our tables, so it’s easy to digest and packed with nutrients. It’s high in potassium, which neutralizes acids in the body, and assists naturally occurring tryptophan to relax the body. According to clipmarks.com, the glucose in honey can interfere with the function of another neurotransmitter in the brain called orexin, which keeps people alert, and so bring on profound relaxation. Don’t forget to share what you learned with some friends and family, it may help make their days a bit more relaxing! Blueberries are more than a delicious fruit. Many consider it to be a superfood. It’s rich in vitamins and phytonutrients (plant nutrients), with a variety of antioxidants that are considered extremely beneficial for relieving stress. Many experts also believe that peaches fall into this category as well, because they have nutrients that appear to have a sedation (calming) effect. Acai berry is essentially the newest super food, and one that has received a great deal of press recently. It may not be the weight loss fruit that many people claimed it was, but acai berries are still rich in phytonutrients like the blueberry, and the antioxidant levels are off the charts. Almonds are an underrated food. They contain zinc, a key nutrient for maintaining a balanced mood – and have both iron and healthy fats. Healthy fats are an important part of a balanced diet, and low iron levels have been known to cause brain fatigue, which can contribute to both anxiety and a lack of energy. Chocolate – especially pure dark chocolate without the added sugars or milks – is also a great food for those living with anxiety and stress. Chocolate reduces cortisol – the stress hormone that causes anxiety symptoms. There are also compounds inside dark chocolate that improve mood. Maca root is not exactly a popular food item in grocery stores, but the powder can be added to several foods and beverages and is found in a variety of health food stores. It’s believed that this root has more phytonutrients than nearly every type of fruit and vegetable, including magnesium and iron – two important nutrients for controlling anxiety. It also is often used for healthy stamina and energy. Healthy eating is one of the best ways to control anxiety and stress. In fact, one of the best things you can add to your diet is to drink more water. Many studies have found that dehydration affects as many as 25% of those with persistent stress or more, and dehydration is known to cause more anxiety. As for foods, anything with magnesium, vitamin B12 (and other B vitamins), zinc, and antioxidants can be beneficial for helping you deal with stress. There are also herbal supplements like kava and passionflower that may be valuable for anxiety. All of the above foods are beneficial for dealing with your anxiety. They provide vitamins and nutrients that are known to calm the mind and body while also increasing energy and stabilizing your mood. Combine those foods with a balanced diet that is free of fried foods and harmful ingredients and you should see a marked difference in your anxiety levels.